Part 1 - "Little Glimmers of Beauty"
Stephanie Juno. Photo by Nic Paget-Clarke. The following interview with Stephanie Juno is part of a series of interviews with some of the members of a group of 25 artists from around the U.S. and Canada who went to Kentucky and Virginia to participate in the initial stages of a multi-year, multi-site community art project sponsored by the American Festival Project. The American Festival Project is based in Whitesburg, Kentucky with Appalshop, a regional community arts center. Also see: Fred Campbell, Rodrigo Duarte Clark, Harrell Fletcher, Shannon Hummel, Suzanne Lacy, John Malpede, Robbie McCauley, Nobuko Miyamoto. Stephanie Juno: I'm Stephanie Juno and I'm living in Oakland, California. In Motion Magazine: Where do you work? Stephanie Juno: I work as the Education Director at the Richmond Arts Center. I've been there for one year. The position gives me an opportunity to advocate for youth and for artists and to create partnerships between artists, community, schools, and businesses. I'm fortunate to be involved with and to be able to help formulate some pretty incredible projects. In Motion Magazine: Can you give some idea of those projects? Stephanie Juno: We have an outstanding group of Artists in Residence who work with us. Some of the artists have worked for the Richmond Arts Center for anywhere from five to twenty years. The residencies with the schools have ranged dramatically during the last twenty years. For example, there was a mural project which involved painting all the doors at Highland School. Two artists, Gary Carlos and Kemit Amenophis, worked with fourth graders on systems. Every door was painted with a different system. For instance, there's the school system, the highway system, the circulatory system, the solar system. It made the school a different place. Another example is at Dover School. There, Erica Clark Shaw and Kemit Amenophis created a mural in the sidewalk about California migration. It's about how all the kids and there families had come from different places. Embedded into the sidewalk are footprints and each footprint tile tells where they came from. Just looking at the sidewalk, you can see that the kids came from Kansas, Thailand, Laos, Mexico. This project was integrated into their social studies curriculum about California migration and California history. These are just a couple of examples which take the classic, let's-do-a-mural-at-a-school to another level. I've been really lucky to get to work with some amazing artists who think beyond the basic. In Motion Magazine: Are the artists from the community? Stephanie Juno: Most of them live in Oakland. Oakland has a very high artist population, as does San Francisco, but I think a lot of artists who can't afford to live in the city (San Francisco) live in Oakland. There's also a number of artists who live in Berkeley, Richmond, and other areas. For the community as a whole, we have free exhibitions of emerging artists from the Bay Area community and an on-site education program with full-scale painting, ceramic, jewelry arts and weaving studios with classes year-round for children and adults. We also have off-site outreach programs such as the Artist in Residence program I mentioned earlier and festivals, tours, and workshops. I'm basically a connecting tissue between the schools, businesses, and community organizations which come to the center and want to partner with artists, who want to provide their kids, or their constituency an opportunity to learn through the creative process. It's like a matchmaker system. It's all custom designed. In Motion Magazine: Custom designed? Stephanie Juno: Yes, there are no cookie-cutter programs. People come and they say what their vision is and then we figure how to make it happen. In Motion Magazine: How are the programs funded? Stephanie Juno: Through the city, the state, private foundation grants, and some matching funds from the schools and the organizations. In Motion Magazine: Is this unique for an arts center? Stephanie Juno: We're the only visual arts one in Richmond. We've been there for sixty-three years. We're unusual in that we are one of the oldest. In Motion Magazine: Sixty-three years? 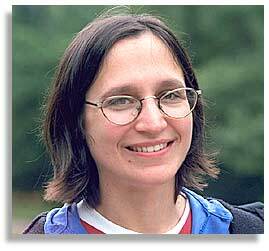 Stephanie Juno: Sixty-three years. We were started by a woman named Hazel Salmi who was hired through the WPA Program, in the Depression, as an artist to teach art in the schools to the children of Richmond. She took a suitcase and she went to all the schools and she taught art classes. After about a year she said, "I really think we need a building". So she got us a building and called it the Richmond Art Center. Then she said, "I think this could be the heart of Richmond." She had a vision that the Art Center could be a part of a big city complex where there would be a city auditorium and the Art Center and the city hall and the police department so that basically anything you needed in the public arena would be in this place. She was on a team that designed it and we've been here ever since, in the building with the Auditorium next door and the City Hall and police department a stones throw away. In Motion Magazine: That's pretty amazing. Stephanie Juno: It is. It very unique. In Motion Magazine: How does your personal art relate to community involvement? Stephanie Juno: Sometimes it's a more overt relationship and sometimes it's more oblique. In Motion Magazine: What is your art? Stephanie Juno: I'm a performance artist. I define my brand of it as theatrical story telling with big costumes and kinetic props, on occasion. My subject matter tends to be about the human condition. It's about different scenarios and strategies of surviving. And how there are these little glimmers of beauty in things that are otherwise rather hideous and grotesque. Those small things can somehow redeem the larger things that they are within. In my work at the Richmond Art Center I see those small pieces of beauty all the time. That feeds me and in turn feeds my work. I love that about it. I can sleep at night because I know I'm doing the right thing with my time. But it's hard work. In Motion Magazine: What were you thinking you would be able to bring here as part of this project? Stephanie Juno: I don't know. I always felt really lucky and surprised that they asked me. Like I said earlier I don't feel special. And I feel like this is a special project. I'm not sure. I think there's great potential for people to meet up with other people and create something. But I'm well-designed for a project like this. In Motion Magazine: How's that? Stephanie Juno: I don't like doing the same thing over and over again. I don't like saying I did this over here and it works, so let's take it and I can do it anywhere. I can go to Kentucky and do it. I can go to Mexico and do it. I could go to Bolivia and do it. I could go to Japan and do it. I have no interest in that and this project definitely does not encourage that. In Motion Magazine: How does it not encourage that? Stephanie Juno: Michael Hunt has said to me the idea is not to come here and do something you've already done. The idea is to come here and to do something different and to stretch yourself in another direction. Not be comfortable. And not stay comfortable. I fully uphold that kind of m.o. I really don't think there's much time so there's no sense in it. Not only would I get bored, but it just seems an ineffective way of functioning to do the same thing. 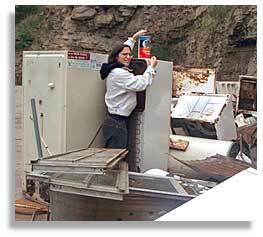 Stephanie Juno taking a photo among some of the used appliances collected at the recycling center. Photo by Nic Paget-Clarke. In Motion Magazine: What have you been doing the last few days? Stephanie Juno: Listening to people. And taking in information and trying to receive all information on a broad-band. I see performers as transmitters and the goal is to transmit with high focus and high clarity at a broad band so that whoever is listening to you can receive at least part of it. Do you know what I mean? Stephanie Juno: So, as a receiver my hope would be to do the same thing - to receive on a broad band at a high level of clarity and resolution. Just like a video camera. And not to edit anything out early on because you have no idea what is useful or what's going to happen. I don't know if I'll leave here at the end of the week and never come back. Or whether it'll be a long relationship. Or a long distance relationship. I don't know. In Motion Magazine: Is your particular group supposed to have a particular goal? In Motion Magazine: So what is your group doing? Stephanie Juno: We've mostly talked to different people in the community and either conducted outright interviews or just had conversations or taken tours. They've had things they want to tell us. In Motion Magazine: You were recording this on video? Stephanie Juno: Video, audio, or not at all depending on how they felt about it and whether or not we had the equipment at the time (laughs). I deliberately didn't bring a camera. I have a video camera and I deliberately didn't bring that. I have a tape recorder and I deliberately didn't bring that. Stephanie Juno: Because I wanted to be the receiving device. I didn't want my reception of what I was taking in to be mediated in any way. If it was going to be mediated, I wanted it to be something that was out of my control and not something I imposed on the situation. If I had brought my video camera, then it would have been my decision whether or not to use it. I decided to take that out of the equation. I happen to be using a pinhole camera that I'm probably not using correctly at all. But it was something that emerged as a possibility that Mike (Gover) created and I think that's a perfect way to document it. Plus, it's something I've always wanted to do. I always wanted to figure them out, but no one ever showed me. I never had the gumption to figure it out myself. And so here it is. That's why I left mine behind. I didn't know why; I just had to trust my instincts, and it worked out. In Motion Magazine: How have you been interacting with the local people and artists? Stephanie Juno: We met the mayor/judge and like Vincent (Thomas) was saying, he is this incredible dancer when he talks about the coal mines and the machines. He has this great twinkle in his eye. An incredibly humble individual. His entire desk is covered with photographs. He has this huge desk and it's got glass on top of it and underneath it's just all photographs of his life. In Motion Magazine: His life? Stephanie Juno: Yes. When he was a coal miner. His family and his kids. His son is in the navy. And then there is Mike Gover who we are staying with. He hadn't thought of himself as a public artist but we were talking about him as a public artist at lunch, actually Eloise (de Leon) suggested that, and I think that it's true. He's definitely an inventor. A conceptual artist. In Motion Magazine: How do you see the interplay between you all from out of town and the people here? Stephanie Juno: I think it's going well. I think it's been interesting that the thing that we've had in common is that no one really knows what's going on. At least in our group. We comment on it to each other at different points in conversations to see if anyone has more information than the other and we don't. So, in a low key kind of way, we say, "Well, we are just going to play it by ear." We have a consensual agreement that has been created out of not having any clear plan. I think that's been incredibly effective. In Motion Magazine: Any examples? Stephanie Juno: When you think about it, collaborations often start and continue. There's really no overt statement of the collaboration. It's an organic thing that just happens. At least that's been my experience, although certainly there's been other times when it's been overt, when somebody wants a contract. But I think what has made it effective is that it has caused conversations that have made it clear that we are in this together-kind-of-thing, even though we don't know what the thing is. Published in In Motion Magazine October 4, 2000.